Bring modern elegance to any indoor or outdoor space with this set of 3 hanging planters. Each plant pot in this 3 piece set is made of white ceramic and features a white rope that allows you to hang the planter from any wall, eave, or ceiling. Fill each pot with a small potted plant, such as a succulent, cactus, or herb, and hang these planters up wherever you wish to bring both modern style and natural greenery to any space. 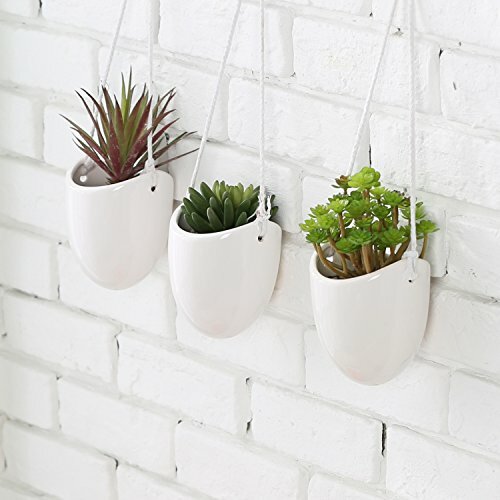 Approximate Dimensions (in inches): 4.25 W X 12.5 H X 3.75 D.
A set of 3 hanging planters made of white ceramic. The rounded interior provides a perfect space to house small potted plants. Perfect decorating any indoor or outdoor space.